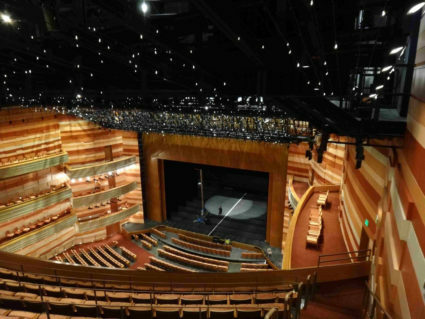 The George S. and Dolores Doré Eccles Theater is Salt Lake City’s newest performing arts center in the heart of downtown. Designed by world-renowned Pelli Clarke Pelli Architects, the theater features a grand six-story lobby with dramatic retractable glass walls. It is a beacon of light and energy on Main Street. Yet, there were several challenges in designing a multi-use hall that could accommodate the needs of various performers. The Eccles Theater is a hub of activity year-round with indoor and outdoor entertainment spaces. The 2,500-seat Delta Performance Hall brings national touring Broadway shows, concerts, comedy and other popular entertainment events; while the multi-use Regent Street Black Box at the Eccles Theater hosts innovative local performances and community events in a smaller, more intimate setting. The Grand Lobby holds public art and events on the outdoor. The variety of performances was one obstacle, as Broadway shows, concerts, ballet, opera and other special events all come to Eccles. Another was the noisy, light rail transit system stationed in front of the facility, which made sound isolation mandatory. And finally, the footprint of the site was extremely tight. The team would have to be creative and collaborative in finding a solution. With their work cut out for them, the team began to explore solutions. The design team included Pelli Clarke Pelli, HKS Architects, Fisher Dachs Associates, and Jaffe Holden. The task was to create a space with acoustic and visual intimacy, one where the audience could be located close to the stage, to experience beautiful sound that wouldn’t be too loud or harsh. Holden says he wanted to create an acoustic volume above the audience seating so that natural acoustics had the perfect resonance and richness for natural sound. They also employed the use of acoustic draperies and banners to appropriately dampen the room’s reverberant energy for amplified shows. There’s a lot of space above the audience in the Delta Hall and a lot going on. First, Pelli Clarke Pelli created an evening sky in the attic space, visible from the audience seats below. The starfield design is a matrix of hundreds of low voltage lights that can dim and twinkle. The real ceiling, however, is dozens of feet above that, which is where the acoustical drapes and banners come in. Nine fully motorized J.R. Clancy draperies (at 25 ounce-per-square-yard) cross the hall from left to right, and two large drapes can be deployed on upper side walls to vary reverberation time. The total coverage area is 6,700 square feet. Holden’s team placed five acoustical banners along the proscenium wall that are 29-feet tall and can be controlled with the press of a button. The system works well for a variety of uses. “If they’re hosting a musical, for example, and they want the ability to draw some of the curtains together and deaden the sound all the way through the audience, so it doesn’t bounce back and forth and muddle the sound, this system allows for that,” explains Scott Madaski of Fisher-Dachs. The Eccles programming requires the use of the orchestra pit for musicians. This was a critical focus of the acoustic design as musicians need to hear their own personal performance as it relates to the entire ensemble. The pit has a number of innovative acoustical features, including large wood acoustic reflectors and acoustical drapes. The draperies, provided by Wenger, were installed on the upstage wall and can be positioned behind specific instruments to control volume. Acoustical panels on the underside of the stage control overhead reflections. The upstage wall behind the drapes is angled and oriented to promote diffusion and dispersion of sound. The draperies are controlled by 87 sets of J.R. Clancy manual counterweight rigging. The system’s simplicity and ease of use were important features. The final products installed were StageTekTM Risers and Pit Filler, as well as Portable Audience Seating. On the seating side, it was important to have sturdy chairs that look and feel like they’re a permanent part of the seating. “These chairs came with fabric that matched the fabric in the hall. Wenger tailored them specifically to this space and they match perfectly,” says Gwilliam. 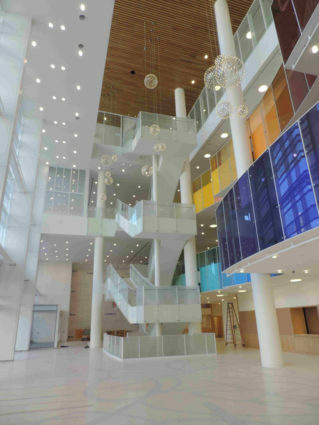 “We also asked that the steel components be the same as the room via powder coating and that was accommodated,” adds Phil Jordan, Cultural Planning and Project Director at Eccles. Jordan adds that the seats were delivered as requested along with custom-built carts allow them to easily transfer the seats from the hall to the storage area. The end result with all of the collaboration between the architect, acoustical consultants, theater consultants and other players involved in the project, is a world class performing arts space that will surprise and delight newcomers and continue to serve the cultural needs of the Salt Lake County community for years to come. Short on Space? Solution: The New Virtuoso Virtual Acoustical Shell.